Using the only example anyone has (Indiana's 73-72 buzzer-beating win against the Wildcats on December 10), here's a 8-step blueprint on how to beat Kentucky. Quick catch-and-shoots are mandatory. One of Kentucky's biggest assets is it's length. That, coupled with the team's athleticism, make executing your offense against the Wildcats in the half court ulcer inducing. By taking quick - but calculated - shots, it helps negate some of Kentucky's closeout length. 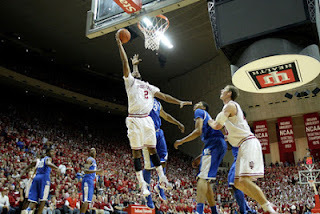 Indiana's first two baskets of the December victory came off screen curls. Jordan Hulls and Verdell Jones III each came off screen and, prior to catching a pass, had their feet set ready for a shot. Push the ball at every opportunity, even when one doesn't seem present. Even though Kentucky doesn't mind playing at a mach speed tempo, its biggest defensive strength is getting set defensively in the half court. When Anthony Davis is able to plant himself in the lane, it's nearly impossible to get any sort of easy baskets. However, if your team can outrun Davis down the floor, especially a big, it makes him seem like "just another tall center." After a driving layup by Kentucky, Indiana's Cody Zeller was able to get an easy dunk on the other end of the floor by sprinting past Davis. Buckets didn't come easy against Kentucky, but this was the easiest of them all. Offensive rebounding is crucial. This goes without saying, but if you can beat Kentucky to a rebounding, most Wildcats will be out of position to stop a put-back attempt. 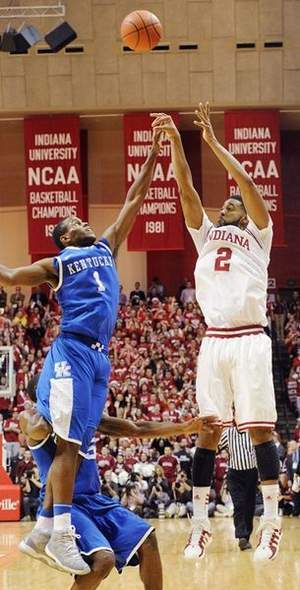 Indiana had 12 offensive rebounds compared to just 26 defensive rebounds for Kentucky. That's a 31.6 offensive rebounding percentage, meaning Indiana had a second opportunity one out of every three shots. Play an inside-out game, and make 3-pointers. It goes without saying that getting hot from 3-point range is a recipe to beat any team, but its' pertinent to beat the nation's best. Indiana went 9-for-15 from 3-point range and most of the shots were fairly open looks. Why? Indiana was able to get the ball into the lane via a Jones, Oladipo or Hulls drive. Zeller finished the game with one assist, but if it were hockey, he'd have more because much of the time he executed the pass to the eventual assister. Get Anthony Davis in foul trouble. Obviously, take out the spine of Kentucky's low-post defense and points in the paint will be easier to attain. Anthony Davis picked up his second foul with 8:03 left in the first half. Those eight minutes were crucial for Indiana to take a 30-29 lead into the half. Davis picked up his third foul just 2:25 into the second half and, after taking a seat on the bench for a while, inexplicably picked up No. 4 with 12:00 to play. Indiana might have gotten a break there because Davis usually doesn't foul 3-point shooters, as he did with Jones, but Indiana's aggressiveness forced Davis to play aggressive as well. It definitely backfired. Force Marquis Teague into jump shots. Sag off Teague. There's no other way to play Kentucky's point guard. He's lethal getting to the basket and that's when he gets teammates easy baskets. On the season, Teague shot 41.2 percent from the field, including 31.2 percent from 3-point range. While Teague shot 6-for-11 against Indiana, the Hoosiers were most effective when they kept him outside the paint. He single-handedly orchestrated a 5-0 run by driving to the hoop for layups that include an And-1. Put your best on-ball defender on Michael Kidd-Gilchrist. While Anthony Davis might go No. 1 in the NBA Draft, it wouldn't be a shock if MKG went No. 2. The kid is the real deal and can take over a game. By blanketing MKG with your best defender (picture Ohio State's Aaron Craft, height disadvantage and all, smothering MKG), he still might get his points, but he likely won't get as many and he'll tire himself out doing so. The season was still young, so Indiana didn't quite know how good MKG was. All he did was score 18 points on 9-for-12 shooting. Much of Indiana's effort was focused on Doron Lamb (19 points on 5-for-14 shooting, including 7 of 11 from the free throw line) and Terrence Jones (4 points on 2-for-3 shooting). That being said, Indiana did have Oladipo guarding MKG, so they obviously knew he was capable of dropping 30 if say, Jordan Hulls was "defending" MKG. Get lucky on the block/charge calls. This is a must for any upset. The way it's being called today (read: idiotically inconsistent) a team just has to hope it's on the right side of a 50/50 split. Indiana caught a few breaks, especially early in the game. There were three first half block/charges that all went against Kentucky. Two were unquestionably the wrong call and the third could be debated either way. Not only does getting lucky keep (or change) momentum, it racks up fouls for the opposition. The funny thing is, despite adhering to this script, Kentucky's opponent still might lose. The Wildcats are that good. Indiana: Obviously, the Hoosiers have done it, so that's the main reason they're on this list. Cody Zeller, despite being a freshmen, still has the skills to be a force in the paint against Anthony Davis. Couple that with Indiana's 3-point shooters (Jordan Hulls, Victor Oladipo, Matt Roth) and it's offensive efficiency and the Hoosiers could see lightning strike twice. 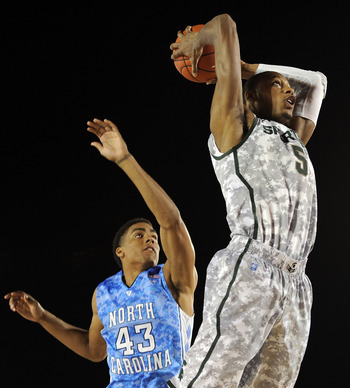 Michigan State: The Spartans are built to play at any tempo - and excel at it. MSU could run Kentucky up and down the floor or it could find holes in Kentucky's half-court defense. It wouldn't be easy, of course, but the key would be to use the tandem of Derrick Nix and Adreian Payne to wear down Davis. Much like the Spartans have done with Ohio State's Jared Sullinger this year, by using two players to act as one center, MSU will be less prone to fatigue than Davis. While not the best 3-point shooting team, the Spartans have had those lights-out nights thanks to Brandon Wood, Travis Trice and even Draymond Green. The entire trio would have to be deadly from long distance. Ohio State: The Buckeyes have athletes that match up well with the Wildcats. Jared Sullinger could body up Davis in the post, Aaron Craft would pester the hell out of whoever he's guarding and Ohio State's 3-point shooters (William Buford, Lenzelle Smith Jr., Deshaun Thomas) all have the ability to stretch defenses. It might be a battle of which big (Sully vs. Davis) can stay out of foul trouble the longest but even if it doesn't come to that, Ohio State is a great 3-point shooting team and that's always a recipe for victory. Kansas: Noticing a trend yet? Teams with significant low-post threats are Kentucky's most likely kryptonite. Thomas Robinson and Jeff Withey would both annoy Davis on defense but would, offensively, force him to play different styles of defense. By not allowing Davis to be comfortable in a deja vu role defensively, he'll be more apt to pick up silly fouls. 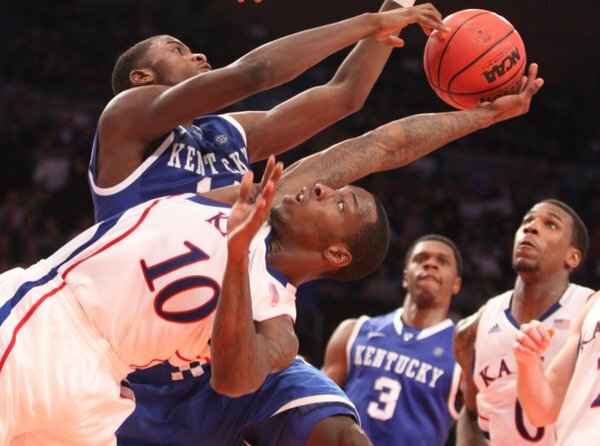 Kansas also has athletes (Tyshawn Taylor, Elijah Johnson, Travis Releford) who could create their own shots. North Carolina: If the early-December game at Rupp Arena is any indication, these teams might be Nos. 1 and 1A when fully healthy. North Carolina has big bodies in the post - so many that playing a pair gives UNC some type of mismatch on defense since Davis is only one man. Kendall Marshall's playmaking ability makes him dangerous against any team and if the game turns into a run-and-shoot, the Tar Heels will feel like they're in heaven. The one negative is UNC's 3-point shooting. In another 73-72 game (this one Kentucky won), the Tar Heels shot 11 of 18 from beyond the arc. It tied for the most triples in a game for UNC this season and is very much an outlier. Typically, UNC will shoot something like 4 of 11, 5 of 14 or 3 of 9. Yes, North Carolina did have a few solid games (10 of 16 vs. Georgia Tech and 10 of 19 vs. NC State) but there were plenty of awful games like the 1-for-10 showing vs. Virginia and 4-for-19 performance at Wake Forest. When it's all said and done, while I feel the above five teams could beat Kentucky, it would take a magical game. I just don't see it happening, but at least here's a blueprint worth following.